Please read below before making your reservation. Cook With Us at Amal Targa! 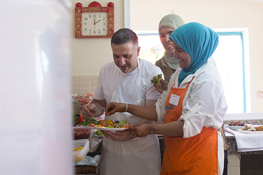 The Amal’s second center in Targa offers cooking classes every morning in traditional Moroccan cuisine. During class you will join others to make traditional Moroccan dishes such as tajines, couscous, or pastilla. Classes start at 9 a.m. and end around 1pm after you enjoy the fabulous meal you have created. Classes are available in English, French, or Arabic . The cost per person is 300* dirhams which includes the class, the meal that you made (one main dish), a recipe card and as much Moroccan tea as you can drink! Cooking classes fill up quickly, please book as far ahead as possible. To reserve your class, email us at amalnonprofit@gmail.com or fill out the form below. Your reservation is not complete until you have email confirmation. Registering in advance is the best way to get the date you want! We are able to prepare one type of tajine for every two-to-three people during the cooking class. In Moroccan tradition, these tajines are slow-cooked over charcoal and meals are eaten as a group. Your tajine will be plenty of food for you and the other members of your group! *Please note: The price of the class will be 350dh for adults and 200dh for children under 10 years beginning January 1, 2019. Our trainees work in our restaurant to gather real life experience through learning how to prep, cook, serve and work to develop skills in a professional setting. 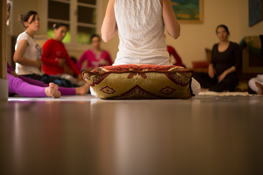 Amal partners with local organisations and international professionals to offer special classes for our trainees!